The UN Climate Change Summit in New York brought many new pledges and commitments on emissions reduction targets, reduced deforestation, and in financing the Green Climate Fund, and many more. It was hailed by by UN Secretary General Ban Ki-Moon as a successful start for negotiating a global climate agreement in Paris in December 2015 at COP21. But Graça Machel, the widow of Nelsen Mandela, who followed Ban Ki-moon in the closing speeches of the summit, identified that there is still "a huge mismatch between the magnitude and of the challenge and the response that we heard here today". Machel is a member of the elders, an independent group of global leaders foundered by Nelson Mandela. Take the Green Climate Fund as an example. 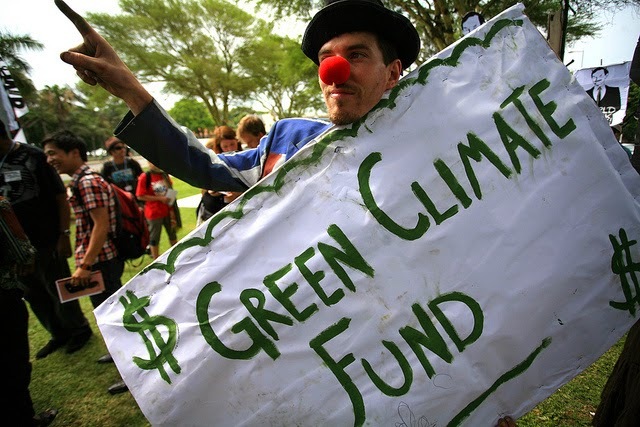 Leaders expressed strong support for the Green Climate Fund and many called for the Fund's initial capitalization at an amount no less than $10 billion. There was a total of $2.3 billion in pledges to the Fund's initial capitalization from six countries. Six others committed to allocate contributions by November 2014. “Oxfam is concerned that developed countries are refusing to specify how they will increase their support to developing countries to reach $100 billion per year by 2020 (agreed at the 2009 Copenhagen COP). This is the first test of the readiness of developed countries to do a deal in Paris. Developing countries have called for at least $15 billion in pledges to kickstart the Green Climate Fund. “It is good that the European Commission reiterates the EU engagement to dedicate 20 percent of the 2014-2020 EU budget for external action on climate action, and details a few funding pledges. This however is not a new commitment and doesn’t hide the fact that the European Commission has not pledged to the Green Climate Fund. There is still a huge gap between the promise made at Copenhagen about this fund and the actual pledges and commitments made. The funds already committed are far short of where they need to be, with many industrialized nations still to commit to the fund including the USA and Australia. 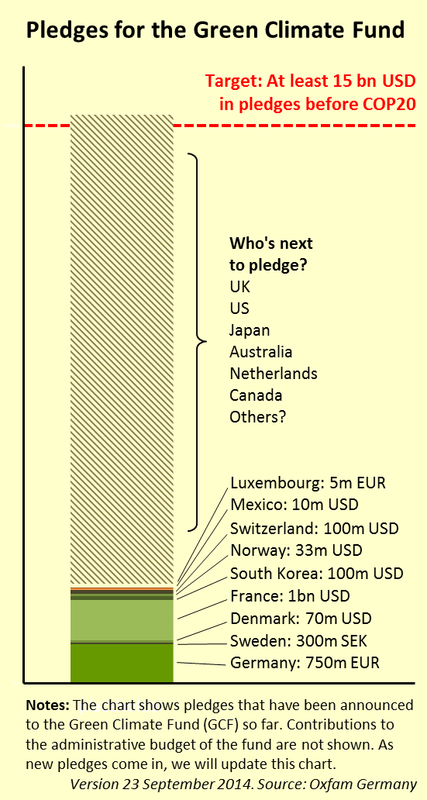 There was just over $1.3 Bn in new pledges to the Green Climate Fund (GCF) from Denmark, France, South Korea, Norway, Mexico, Luxembourg, Czech Republic, and Switzerland made at this summit. There were also several initiatives announced to mobilize private finance for climate action. Al Gore warned that strong standards are needed to ensure the finance was effective and not just green-wash: “We welcome the increasing interest of investors in greening their investments and dumping fossil fuels. But strong standards to guide private finance flows, agreed to by developing countries and affected communities, must be established as a priority to ensure the trillions of dollars that will flow really are green - not green-wash."
Total amount pledge to the fund to date: $2.325m ($2.3 billion). Oxfam has called for at least $15 billion in public finance to capitalize the Green Climate Fund for its first three years of operations. Current pledges fall far short of that goal. Original version of this article published at San Fransisco Bay Area Indymedia. Indybay.org 23 September 2013 - Transcript - Graça Machel: Are pledges enough to avoid the climate change precipice?